Fairtrade. 20 individually wrapped teabags.Our Fairtrade green tea is made from 'Sencha' leaves, meaning they have been steamed to preserve their delicate, crisp taste and sweet character. Green tea is best enjoyed without milk. 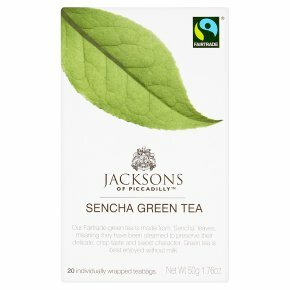 Jacksons Fairtrade green tea is sourced from a group of tea estates in China where the humid climate, plentiful vegetation, rich moist soil and ample rainfall provide the unique natural conditions suitable for growing the best quality tea. The bud and the top leaves of the plant are hand picked in Spring and gently steamed. This renowned"Sencha"process yields a bright gingeryellow liquour and smoother tasting tea, which is subtle, fresh and sweet grassy in character with little bitterness. Brewing guidelines Use just boiled water and allow to brew for 1-2 minutes dependent on desired strength.